Think. Grow. Eat. 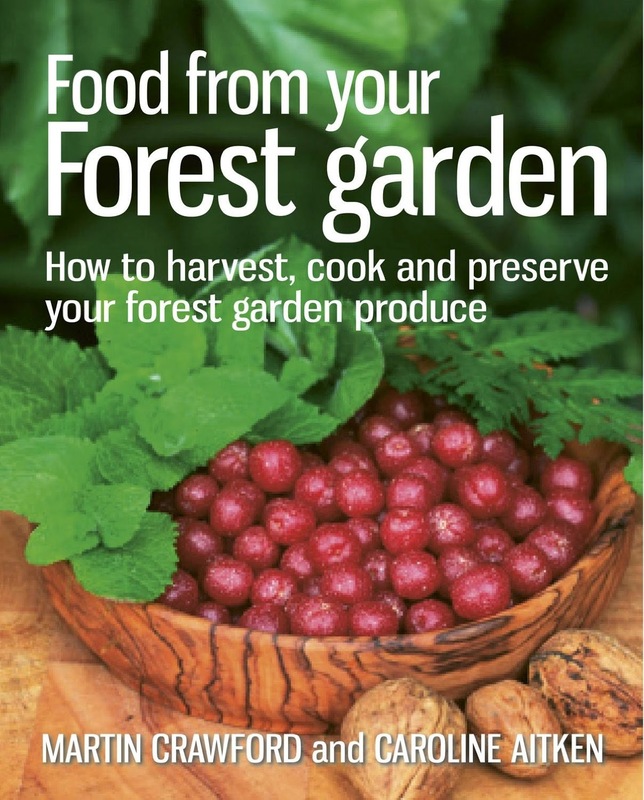 : Winter dreaming of permaculture paradise! Following a busy, work-filled summer and harvest I always look forward to the winter for a bit of a rest. Doug and I often say to ourselves "It'll be nice when things slow down a bit in the winter" as we pass like ships in the night throughout the hectic growing season. However, when the nights do begin to draw in and we feel we should be slowing down, we actually just find ourselves donning a head torch and working in the dark! Still, hope springs eternal as they say, and perhaps once we have our 'system' established here at Tawny Oaks, we can live the permaculture dream of walking in to the garden in the morning, laying down and opening our mouths and waiting for the food to drop in - and that will be the extent of our labour! Until this dreams manifests we have plenty to keep us busy during the winter. 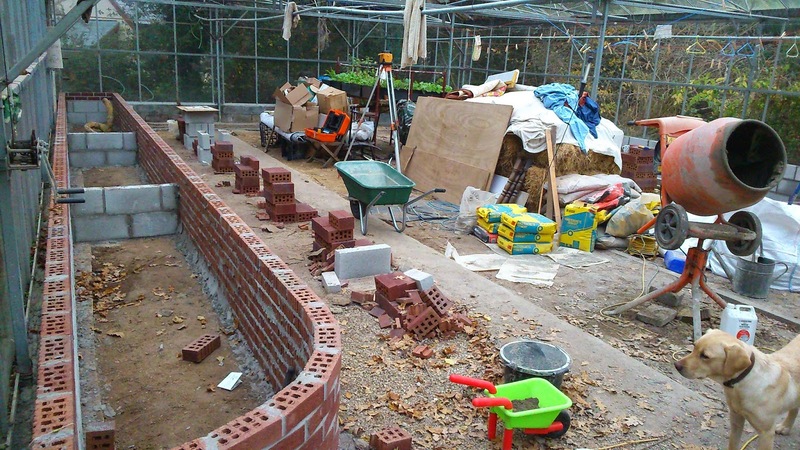 There are the usual seasonal jobs as I outlined in my blog post on the PWA website, but as our renovation of this old plant nursery continues, we have bigger projects afoot as well. One of our most exciting features on the land is the enormous 10 x 15m glasshouse. This is one of four commercial sized glasshouses here but by far the biggest and newest - the other three being in much worse disrepair. We immediately saw it's incredible potential, so have had to think carefully about how we make the best use of it, knowing that we have no intention to go in to commercial food production and have little interest in selling ornamentals. One limiting factor of this mighty structure is, in fact, its effectiveness at harnessing the sun's rays. In the summer, on a clear day it is unbearably hot and even with all of the roof lights open, you can't be in there for more than a couple of minutes. Even if using mulches the heat stress could be too much for many hardy crops, so we plan to use it for tender food crops which can tolerate those heat levels. Luckily it has a huge rainwater catchment potential on the roof. We have about 1000mm of annual rainfall here, so that gives us the potential to harvest approximately 150,000l of rainwater per year. We are working on a way to create a self-watering system with the existing structure - any ideas welcome. The 150 square meters within is also a great social space at other times of year, and although it has mostly been used as a laundry drying area and storage space since we moved here, we feel it could become a beautiful, multifunctional space for growing, hosting, celebrating and teaching. So the plan is to build in permanent raised beds around the inside walls. The beds will be deep as there is currently a concrete floor (which we've made drainage holes into) and we plan to grow exotic fruit trees in them; apricots, peaches, nectarines, lemons and limes along the northern wall. On the southern wall we'll grow sun-loving herbs and vegetables like tarragon, aubergines and peppers- all of which I love to cook with. In the middle of the space we will have mobile benches for seedlings and pots, or for craft work which needs dry weather and plenty of light such as Doug's woodwork or my basketry. We could take in chairs to make a workshop space or a feasting hall, or move it all away for a party or ceilidh. 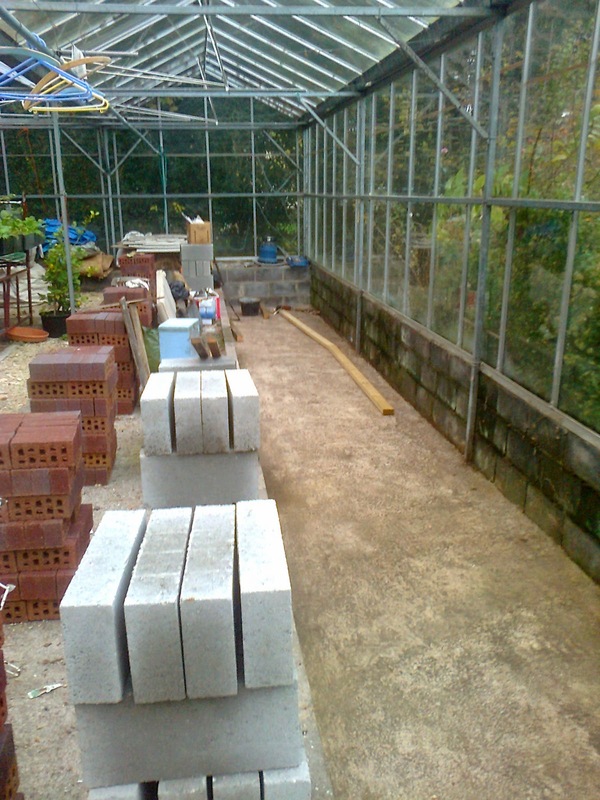 To make the space more useable in the winter we'd like to build a rocket mass heater with an integrated warm cob bench. This kind of heater gives off radiant heat which heats the objects within the space more than the air between them - far more appropriate for a building like this than using a normal wood burner which would heat the air and escape very quickly through the thin glass walls. We already have a passion flower vine growing vigorously against the western wall, which sadly doesn't have edible fruits, but we hope to plant in a grape vine to help with shade in the summer and bear some good fruit. Perhaps we could move on from our accidental cider making, to some home-made wine! Although I suspect it would take more of a conscious effort to achieve something palatable! The thing I love best about the glasshouse is the indoor-outdoor space it provides. When the mizzle has descended and the chilly wind picks up I can feel like I'm stuck in a fish bowl as I peer out through the kitchen window. The glasshouse allows us to be out of the house, surrounded by the green of the garden but safely out of the weather. Such a wonderful thing! This project is taking up most of our spare time and energy this winter, but there are other projects moving gently along at the same time. We have finally (fanfare please) finished our new bathroom! This may not sound very exciting, but the original bathroom was something akin to an icy cave, appealing only to spiders and black mould, so we are really very excited, having finished it only yesterday. I can't wait to give my son his first bath in a warm room! He's a hardy little thing and I don't think he really noticed how cold it was before, but we did. You may remember my descriptions of our raised beds - concrete blocks, no soil, compacted vermiculite on top of solid yellow clay? Well, after a few years of depressingly weedy crops we decided to get to it and sort them out. Raised bed 1 has had a complete overhaul, thanks to our wonderful wwoofer Boris who dug down about 2' into the rock-like clay, then carefully layered up soil and compost of gradually increasing quality until it was full to the brim. In the spring we'll apply some aerated compost tea to the soil to get the microbial life going, and hopefully we'll never need to take a spade to it again unless we're digging up a root crop. We'll see how the bed fares next season and decide on whether to do the same to the remaining 3 beds next winter. Meanwhile we are beginning to plan the growing season ahead, which is always very exciting. I have a lot more planning to do as well as it looks like 2015 will be a packed year of teaching for me with PWA, The Sustainability Centre, High Heathercombe and Shift Bristol. Not to mention the wonderful Green Gathering festival and any other events that crop up. 2015 will also see London hosting the International Permaculture Convergence which sadly I'll miss as, ironically, I'll be teaching permaculture. With all of this on the horizon I'm looking forward to having a week off over Christmas to enjoy time with my family and share the fruits of my labour - bramble jam, sloe gin, sauer kraut, cider, stewed apple, plum pudding, quince tart, yum, yum, yum! Just wonder why your passion fruit vine doesn't bear fruit as ours has fruited heavily every year since we grew it from a supermarket fruit's seed. The variety of course is P. edulis, the dark purple ones, and ours grows in an old 'cellier' with three walls and a polycarbonate roof and glass door front. Not a lot of light but never freezes and the p.f. loves it. Are your vines getting frosted? Or do you prune them back too much? They should be flowering around May/June time and producing fruit through the summer months. Good luck in getting them going in your refurbished greenhouse. We adore the fruit and usually harvest in excess of 100 of them. It seems to be an ornamental variety- it has white flowers and fruits heavily but the fruits are like empty shells- very strange! It's incredibly vigorous and puts on a lot of growth each year so we do cut it back heavily to stop it taking over, but it's actually growing from a crack in the concrete skirt of the building, so must have self-seeded some how. I'd love to include an edible variety in our collection, good idea. It would also help to add some shade in the summer. Looks like a lot of work, but it will definitely be worth it! I worked on a farm when I was younger, and one of the major projects we did was rebuilding a glasshouse that had been damaged in a storm, in similar shape to what yours looks like. While a lot of effort, definitely worth it for growing crops out of climate.